The right decision for your workplace. Whether you are building a new facility or updating an existing one, there are a myriad of safety decisions to make. One decision, however, is now crystal clear. To best protect your workplace and employees, choose the 7800 Controller from 3M. This product brings to bear our more than 75 years of expertise in safety design and innovation. 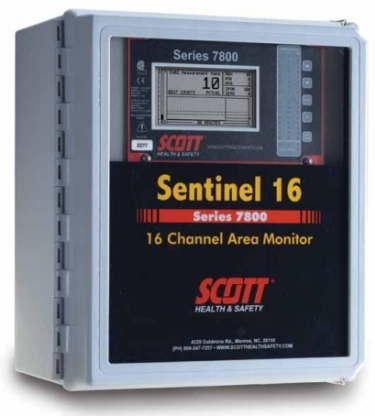 The 7800 Controller provides the ability to accurately monitor multiple gas and flame detection points from one location, thereby reducing installation costs. Scalable, flexible, easy to use. The 7800 Controller centralizes the display and alarm processing functions in critical multi-point gas and flame detection applications. Its modular design integrates easily with up to 32 gas or flame detectors and is available in a fiberglass or stainless steel NEMA-4X enclosure, a cast aluminum NEMA-7 explosion proof enclosure, as well as panel mount and 19" rack mount configurations. As your needs grow, the drop-in I/O boards of the 7800 Controller make upgrading the unit in the field quick and inexpensive. Five simple function buttons make configuration and setup of the 7800 Controller easy and intuitive. Built-in programming flexibility allows you the ability to configure the controller to the needs of a wide variety of applications. Moreover, alarm LEDs indicate three levels of alarm status for every channel monitored. Robust analog and MODBUS I/O capabilities. Standard with the 7800 Controller is the ability to retransmit a MODBUS RTU RS-485 signal in both master and slave configurations. This allows up to 128 controllers to be multidropped onto a single data highway for interrogation by another MODBUS master. They may also be cascaded by connecting one unit's master port to another's slave port. In addition, optional 4-20 mA output boards allow communication with PLCs, DCSs or other control devices. 093-0312	I2C 10ft cable Assy - used in interconnecting option boards when they are separated by more than three feet. 093-0271	Catalytic Bead Input Board - requires the addition of 093-0297 two channel catbead modules. An input Board accepts four, two channel modules (8 inputs).